Oy! That was quite a season finale, wunnit? You just knew these last two Doctor Who episodes of the season — “The Stolen Earth” and “Journey’s End” — were going to be legendary as soon as the opening credits rolled. David Tennant, Catherine Tate, Freema Agyeman (Martha Jones), John Barrowman (Captain Jack Harkness), Elizabeth Sladen (Sarah Jane Smith), and Billie Piper (Rose Tyler). At this point, you knew things couldn’t possibly be boring. But it didn’t even stop there. Because Captain Jack is joined by Torchwood members Gwen and Ianto, Sarah Jane by her adopted son Luke, and Rose by ex-boyfriend Mickey and mom Jackie. In short, it’s a free-for-all, with each team of Doctor-inspired heroes doing their part to save the universe. 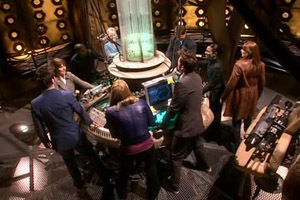 This finale was Russell Davies’ last big hurrah as head writer of the series, and as such, it ties up just about every loose end from the past four seasons, while at the same time bringing new life to an old foe. Davros, with the help of some new Daleks he’s created, yanks twenty-seven planets out of space (and time), including Earth, and lines them up just so, for the purpose of creating a “reality bomb” that will destroy (or “uncreate” really) everything in existence except the Daleks. But The Doctor and his friends stop him, and everybody lives happily ever after. THE END. 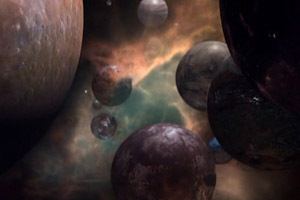 Meanwhile, on Displaced Earth, the Torchwood team, Sarah Jane & Son, Martha Jones & UNIT, and Rose Tyler with Donna’s family are all contacted by former Prime Minister Harriet Jones using a sub-wave network created by the human-looking alien dude who The Doctor brought to Earth at the end of the Titanic Christmas episode. Joining all their technologies, the Friends of Doctor are able to reach outside the pocket dimension to call him — “Can you hear me now?” — and he and Donna come running. 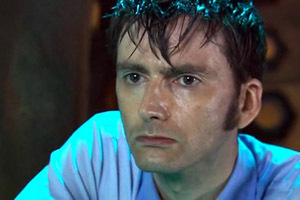 But the second he gets there, The Doctor sees Rose, loses focus, gets shot by a Dalek, and is forced to regenerate … leaving us to wonder for a week if it’s the last we’ll ever see of David Tennant. 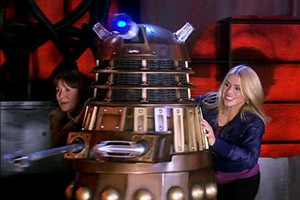 In between the regeneration and Donna getting Doctored, pretty much everybody gets captured by the Daleks. Davros reveals his evil plan, and we find out that most of it is predicated on the ramblings of Dalek Caan (“Caaaaaaannnnn!!! !”) of the Cult of Skaro, who we last encountered in 1930s Manhattan, building the Empire State Building for the purpose of turning all humans into Daleks. His emergency time jump after that failed plan plopped him in the middle of the Time War (between the Time Lords and Daleks), where he saved Davros, and went insane in the process — but also became prophetic. Unbeknownst to Davros, Dalek Caan has actually orchestrated most or all of the coincidental events that have brought The Doctor and Donna together, because he believes that the Dalek race is evil and needs to be destroyed. And in the end, it is, when — after Doctor Donna thwarts Davros’ plan and the three Doctors send back every planet but Earth — Donna Doctor flips the switch that sets off a chain reaction that kills every remaining Dalek, including Davros, who refuses to be saved. Bad Donna Doctor! With the Dalek threat eliminated, all that remains is to get Earth back home again. To do this, The Doctor takes advantage of having so many friends to fly the TARDIS “like it’s meant to be flown” — with six pilots instead of just one. Using the Torchwood rift in Cardiff as a “tow rope,” and with the help of some coding wizardry from none other than K-9 (“Good dog!”), The Doctor and his crew fly the Earth back to its usual location in a fanfare of angelic music. Brilliant! Seriously, if you weren’t jumping up and down in your seat at that point, you might just be a Cyberman. Get yourself checked out. In the end, Earth gets home safely. Sarah Jane returns to her son. Martha and Mickey leave with Captain Jack. The Doctor drops off Rose, Jackie, and Donna Doctor at Bad Wolf Bay in the parallel universe. Apparently, Donna Doctor, having been “born” in the heat of battle, is too volatile for this universe, and so — in a happy romantic ending seemingly torn from the pages of fan fiction — Rose finally gets to have her Doctor, who, because of his human side, will grow old and die with her. But the other side of the equation is not so happy. 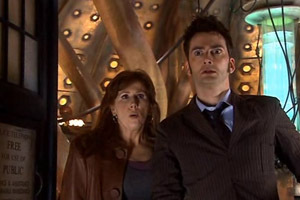 Because Doctor Donna’s human brain is busting at the seams trying to hold on to a head full of Time Lord knowledge. 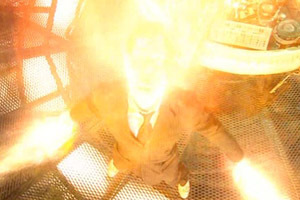 In order to keep her from dying, The Doctor must wipe all memories of himself and the TARDIS from her mind, and warns her mother and grandfather that if she ever remembers him, even for second, she’ll “burn up.” But the up side is that Donna’s mother now has a new found respect for her daughter, and one hopes that this will ultimately improve Donna’s opinion of herself over time. And then the Whoniverse squeed. And so, once again, The Doctor is alone. This time without even so much as a cliffhanger ending. Only himself, and the TARDIS, and his own thoughts. And two more years until the next season begins. Oy! But never fear … there will apparently be a handful of specials between now and then. And when the show returns, Steven Moffat — writer of episodes “The Empty Child”, “The Girl in the Fireplace”, “Silence in the Library”, and one of my all-time favorites, “Blink”, as well as the awesome series Jekyll — will be the head writer. So I expect only fantastic things for this franchise in the future. Donna!!!! Saddest ending ever, and I was shocked how attached I had become to her. I was thinking he should at least offer her grandfather a ride on the Tardis. Great TV. I thought the crazy genocidal Daleks (Khan? 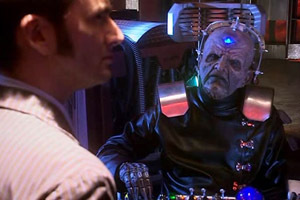 and Davros) were awesome foes. I really enjoyed the ride that was the last few episodes. It got beaten up pretty bad on io9 and a few other places for it’s fan service and wonkiness but I didn’t mind. It had a very epic feel and went to a level the show has never gone to before. I know it’s gonna be forever but I am looking forward to where they go from here.